Every King must have his throne. Perfect anywhere in a home, office or cabin, but most appreciated by All on a Bathroom Wall! 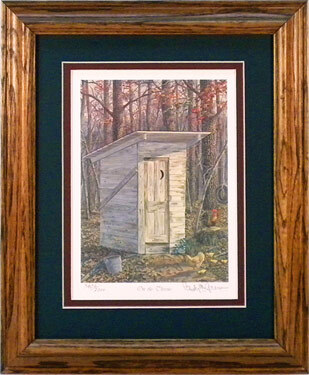 Image Size: 6 3/8" x 4 1/4"
Frame Size: 9 1/2" x 11 1/2"
We can ship framed print orders same day - no extra charge! Additional shipping charge for any order out of the USA is required. To avoid overseas shipping delay, please contact us before ordering. Call for a free catalog of all wildlife art prints by fish and wildlife artist Randy McGovern. Order NOW! This Limited Edition could be Sold Out at ANY time! All Content Copyright © 1983-2019 by McGovern Wildlife Art Collection. All Rights Reserved.